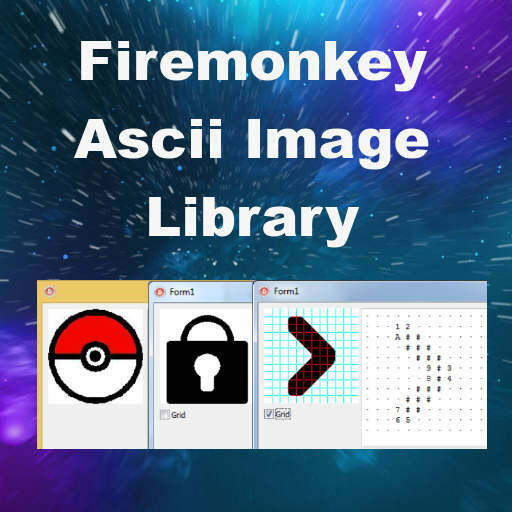 Developer Alexander B. has created a version of the AsciiImage library with support for Delphi XE8 Firemonkey. The AsciiImage library was originally created by Charles Parnot and is a way to generate shapes and images at runtime based on an ASCII map of characters. An ASCII character map can be created that represents the image and then is rendered out as the image. You could use this to generate icons either at runtime in your app or you could just run it during development and save the images out to be included as bitmaps. Theoretically this AsciiImage library for Delphi should work on all Firemonkey platforms which are Android, IOS, OSX, and Windows. You may have to tweak it a bit if there is some specific drawing calls like InvalidateRect which may have to take place on Android for it to work correctly. The library also supports the VCL. This is a free library so if you want to have some fun or just to learn about drawing in Firemonkey check this one out. This library should also work in Appmethod. There are two blog posts with more information about AsciiImage for Delphi here and here. Head over and download the full source code for Delphi XE8 Firemonkey from Github.